A little while ago, I was riding to a downtown destination by way of San Jacinto Blvd, and noticed that they had striped it for bike lanes. Without wading into the controversy of whether bike lanes really are good for cyclists or not, I have to say, they really blew it here. The diagram above shows the lane striping at the 10th-Street intersection on San Jacinto. If you’re on a bike and headed straight, what do you think you ought to do here? If you stay in the bike lane, you’ve potentially got two lanes of traffic turning across your path. In order to avoid that problem, you need to swing across a lane and a half of traffic well before you reach the intersection. Neither is a good option. The latter is less bad, but will be counter-intuitive to a naïve cyclist. While I’ll be the first to admit there are a lot of people on bikes who do dumb stuff that understandably pisses off drivers, I wonder how often drivers are getting pissed off at cyclists who are just responding sensibly to poorly designed situations like this. Coming home by way of Trinity Street, I discovered bike lanes there as well. 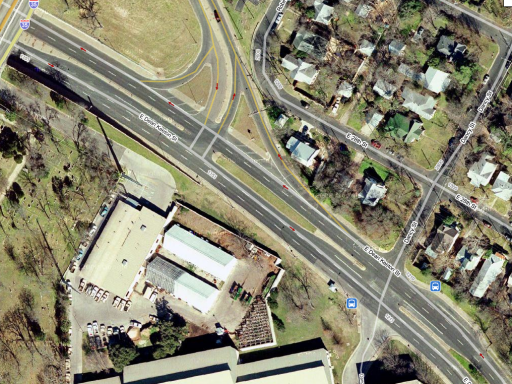 Although I didn’t notice any intersections that were striped as egregiously badly as the one on San Jacinto, the oddity on Trinity is that the location of the bike lane relative to the curb changes from block to block. One block there’s a dive-in parking lane between the bike lane and curb. The next it’s immediately next to the curb. After that there’s a parallel parking lane between the bike lane and the curb. Unless you know in advance where you should be aiming, you will find yourself out of the bike lane after crossing almost every intersection. And the street is just hilly enough that in many cases, the bike lane on the far side of the intersection is invisible behind the crest of a hill. It seems impossible to me that these bike facilities were designed by anyone who rides a bike.